« Footy ‘s Off Season ? 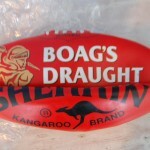 Its all happening in the so called , " off season " , of the AFL footy competition . Fans wearing their footy jumpers , jerseys , guernseys ,watched on in horror as the Aussies lost to the better team of the series . Coaches and footy teams are talking uo their latest recruits whilst GWS , the AFL's new Sydney team , prepare for a draft pick coup on the 24 November . The Saints are back on St Kilda Beach . Hundreds of loyal fans turned out , in their Saints football jumpers , jerseys , guernseys , with new coach , Scott Watters , captain Nick Rieweoldt and defender Sam Gilbert to film ' saints on the beach ' . 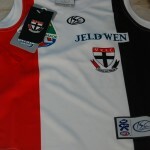 A new cocktail , you ask , no , its the Saints latest publicity stunt , to secure membership for 2012, and promote the team . It is the earliest many bleary eyed fans have got out of bed , and ventured to St Kilda Beach , since their night clubbing days at Bojangles in the 70's , at the same location . 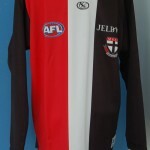 On hand, looking resplendent , in their football jumpers , jerseys , guernseys, the beach was awash with the red , white and black. 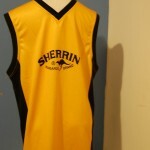 This entry was posted on Wednesday, November 9th, 2011 at 8:35 am	and is filed under AFL, football jumpers, NRL. You can follow any responses to this entry through the RSS 2.0 feed. Both comments and pings are currently closed.